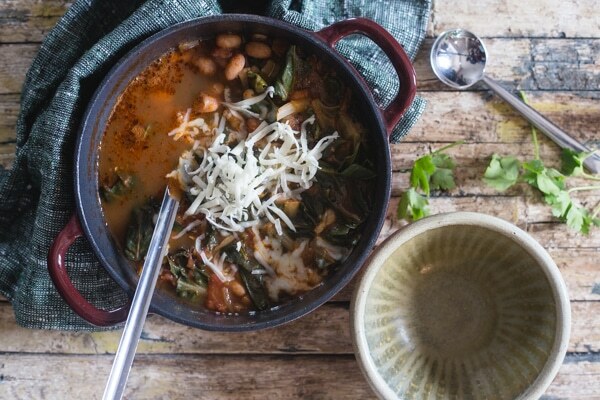 This Italian Bean Soup is made with two types of Italian Beans, Cannellini and Borlotti. 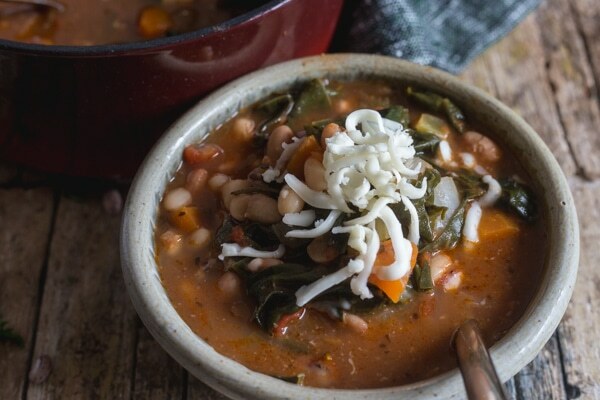 The perfect comfort food soup, filled with beans, tomatoes, carrots, spices and Swiss chard. As far as winters are going, this year has been colder than usual in Italy. Certainly not as cold as Canadian winters, but for Italians it’s hat, scarf and gloves time. Schools were even closed for a few day not too long ago. Makes me laugh when I think of what a real winter is! I know a lot of people use canned beans to make soup, but not me. There is nothing to soaking your dried beans to cook slowly in a big pot the next day. Just remember that 1 cup of dried beans will give you about 3 cups cooked beans. There are three different methods for soaking dried beans for cooking, the first which is the Traditional Method. This is what I usually do, which is to soak the beans for 8 hours. 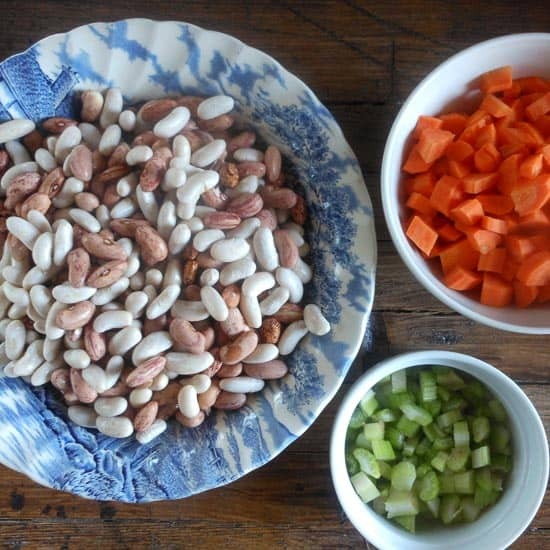 I place the dried beans (I rinse them in cold water first) in a bowl covered with cold water before I go to bed and in the morning they are ready for cooking, just drain, rinse and cook. The second method is the Hot Soak method, place beans in a large pot and cover with 10 cups of water for every 2 cups of beans. Then heat to boiling and continue to boil for 2-3 minutes. Remove the pot from the heat and let stand for 4-24 hours, then drain the beans and cook. The third method is the Fastest method, which could come in handy if you forget to do the Traditional method. Place the beans in a large pot and add 6 cups of water for every 2 cups of beans. Then heat to boiling and continue to boil for 2-3 minutes. Remove the beans from the heat and let stand one hour. Drain the beans and rinse with cold water. Then cook until tender. Cannellini – also known as White Italian Beans, white kidney beans. Lenticche -also known as Lentils, with different colours from yellow to red/orange to green, brown and black and are only available in dried form. 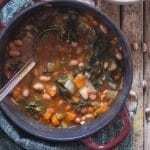 This two Bean Soup is filled with Cannellini and Borlotti beans, carrots, celery, onion, tomatoes and some delicious shredded Swiss chard. If you don’t like Swiss chard you can always substitute with spinach or beet greens. 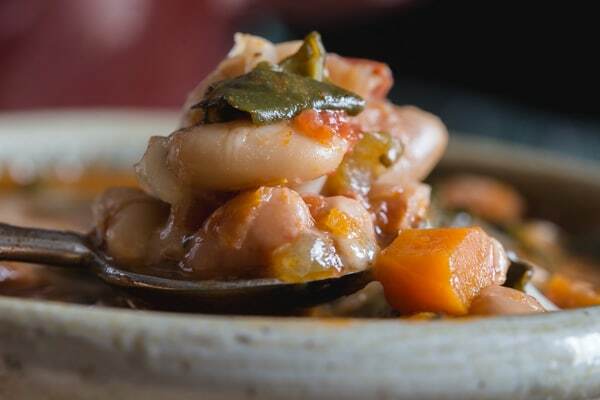 Don’t forget all those amazing spices, with just the smell of the aroma you will be able to imagine how delicious this Bean Soup is. What I love so much is that it not only tastes amazing but it is also really healthy. Remember to use dried beans and not canned, just soak your dried beans over night, rinse them before you cook them and you are ready to go. 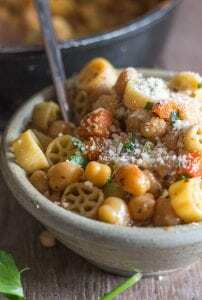 A one pot super easy Italian Bean Soup. Top with some shredded cheese, so good. 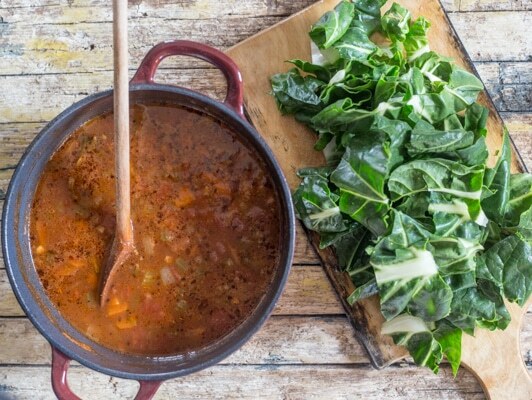 Serve this soup alone or with a slice or two of a Crusty Italian bread or Homemade Focaccia and you have just served the perfect fall /winter comfort soup, no matter what your weather is. Buon Appetito! 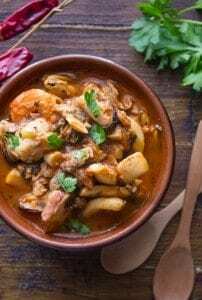 CLICK HERE TO SAVE THIS RECIPE TO MAKE LATER! 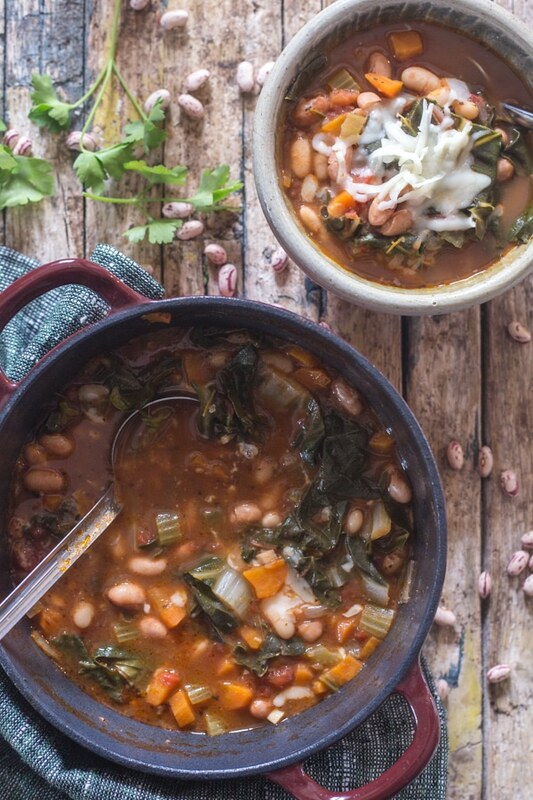 Two Bean Soup, a delicious combination of beans, swiss chard and veggies. Perfect comfort food. *Soak for 8-10 hours in cold water, rinse before cooking. More water may be needed. In a large pot add olive oil, chopped onion and garlic cook on medium / low heat for 2 minutes or until onion is transparent, then add the chopped carrots, celery, drained and rinsed soaked beans, can of tomatoes, water, bouillon cube, oregano, basil, bay leaf, salt, hot pepper flakes and rosemary, stir to combine. Bring to a boil then lower and simmer for approximately 1 hour or until the beans are tender, in the last 5 minutes (beans should be tender) add the chopped swiss chard*, stir to combine, (at this point taste for salt you might need to add some extra) cook for the remaining 5 minutes, then serve immediately. Enjoy! 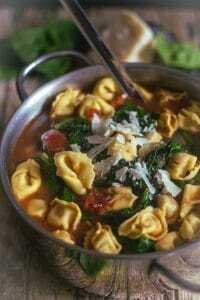 *If you don't like swiss chard you can always substitute with spinach or beet greens. Updated from November 11, 2014. Very cold today so this sounds perfect! Hi Susan, sorry it’s so cold, but I do hope you enjoy the soup. When I saw the photo, I thought…yum, comfort food. That’s what this soup is for me, I love bean soups. The photos are beautiful. Hi Veronica, I love bean soups too, I make them as often as I can. Gotta love the Italians LOL.